The AT&T Byron Nelson is the 10th tournament to experience a suspension of play this season. The last time play was suspended due to weather at this event was last year in the opening round. This was the 21st playoff in AT&T Byron Nelson tournament history. The most recent was last year when Sergio Garcia defeated Brooks Koepka with a par at the first hole of sudden death. The AT&T Byron Nelson was the fifth event decided in a playoff this season, with the Zurich Classic of New Orleans won by the team of Cameron Smith/Jonas Blixt, the most recent. Billy Horschel birdied two of his final five holes of regulation to shoot a final-round 69 and match Jason Day at 12-under 268. He holed a 60-foot putt for birdie at No. 14 and two-putted the par-5 16th for birdie. Horschel won at the first hole of sudden death after making a regulation par and watching Day three-putt for bogey. The victory marked Horschel’s first win in a playoff on the PGA TOUR. Horschel was the first player eliminated in a six-man playoff earlier this season at The RSM Classic, eventually won by Mackenzie Hughes. The 2014 FedExCup champion is a four-time PGA TOUR winner: 2013 Zurich Classic of New Orleans, 2014 BMW Championship, 2014 TOUR Championship, 2017 AT&T Byron Nelson. The AT&T Byron Nelson victory came in Horschel’s 166th PGA TOUR start at the age of 30 years, 5 months and 14 days. Horschel began the week No. 71 in the FedExCup standings and moved to No. 15 with the win. Horschel began the week No. 76 in the Official World Golf Ranking and is projected to move comfortably inside the top-60 and earn an exemption into the 2017 U.S. Open at Erin Hills in Wisconsin next month. The top-60 after May 22 will earn exemptions, as will the top-60 after June 12, which is the Monday prior to the championship. Horschel made his third start at the AT&T Byron Nelson, with missed cuts in his previous two starts (2011, 2012) at TPC Four Seasons Resort. Horschel entered this week on the heels of four consecutive missed cuts. The last time he missed at least four consecutive cuts came in 2011, his rookie year, when he missed five cuts from the AT&T Byron Nelson through the John Deere Classic. In 16 starts this season, Horschel now has five top-25 and three top-10 finishes, including Sunday’s victory. Jason Day three-putted for bogey and was defeated by Billy Horschel at the first hole of sudden death after both players had tied at 12-under 268. It was Day’s third playoff on the PGA TOUR and his first loss. With his solo runner-up finish, Day will pass Hideki Matsuyama in the Official World Golf Ranking, moving from No. 4 to No. 3 behind Dustin Johnson (1) and Rory McIlroy (2). Day was seeking his 11th PGA TOUR victory and first since THE PLAYERS Championship in 2016. Day produced his second-best finish in his fifth appearance at the AT&T Byron Nelson. He won the event in his inaugural appearance in 2010, followed by a fifth-place effort in 2011 and T9 in 2012. He was T27 in 2013. Day (2010) was seeking to join Sergio Garcia (2004, 2016) as the only multiple winners of the event since it moved to TPC Four Seasons in 1983. Day began the week No. 106 in the FedExCup standings and moved to No. 39 with the runner-up result. He is seeking his fourth-consecutive top-10 finish in the FedExCup, having finished 10th in 2014, third in 2015 and sixth in 2016. Sunday’s playoff loss is Day’s best result this season. In 10 starts this season he now has two top-10 finishes (T5/AT&T Pebble Beach Pro-Am). James Hahn made a valiant effort on the final hole, almost holing his approach from 121 yards, with the ball spinning back to catch the hole and finish four feet away. He holed the putt to finish 11-under and miss the playoff by a single stroke. Hahn entered the final round with a one-stroke lead. The 54-hole leader/co-leader has won just four times in the last nine years at the AT&T Byron Nelson (Adam Scott/2008, Jason Dufner/2012, Brendon Todd/2014, Steven Bowditch/2015). This week marked Hahn’s second 54-hole lead on the PGA TOUR, eventually finishing T3 at the 2013 AT&T Pebble Beach Pro-Am. Hahn now has two bogey-free 64s this week (rounds one and three). 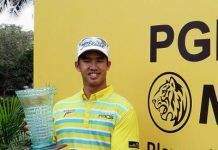 Hahn was seeking to become the second-consecutive Korean-born player to win on the PGA TOUR, following Si Woo Kim’s win at THE PLAYERS last week. He is one of eight Korean-born players who have won on the PGA TOUR: K.J. Choi (8), Y.E. Yang (2), Sangmoon Bae (2), James Hahn (2), Si Woo Kim (2), Kevin Na (1), Seung-Yul Noh (1), Danny Lee (1). Hahn is a two-time winner on the PGA TOUR. After missing eight consecutive cuts, Hahn recorded a playoff victory over Roberto Castro at the 2016 Wells Fargo Championship. His first victory came at the 2015 Genesis Open. Hahn’s previous-best finish in three starts at the AT&T Byron Nelson was a T5 finish in his first appearance in 2014. He followed with a T55 in 2015 and T46 in 2016. Hahn owns 11 career top-10s (including two wins). His third-place in Dallas is added to his ninth at the CIMB Classic as his two top-10s this season. Hahn began the week at No. 105 in the FedExCup standings and moved to No. 62. After joining the PGA TOUR in 2013, Hahn has advanced to the FedExCup Playoffs each season, with his 39th place finish last season his best showing. Jason Kokrak fired an even-par 70 in the final round to finish fourth. Kokrak’s only other appearance at the AT&T Byron Nelson was in 2012 (72-74/MC). Now with 17 starts this season, a T15 at the OHL Classic at Mayakoba was Kokrak’s previous best finish before this week’s fourth. Kokrak began the week at No. 121 in the FedExCup standings and moved to No. 92. After joining the PGA TOUR in 2012, Kokrak failed to advance to the FedExCup Playoffs in his rookie season but has done so in the past four seasons, with No. 33 last season a career-best. Additional Kokrak highlights this week: Second-round 62 Friday marked his career-low round on the PGA TOUR, topping the 63 he posted during the first round of the 2013 CareerBuilder Challenge (finished T8)…Five-stroke lead through 36 holes topped the previous AT&T Byron Nelson record of four strokes set by Davis Love III in 2000…36-hole total of 128 tied the tournament record, which four players have matched five times: Ben Crane/2016, Steve Pate/1999, Tiger Woods/1999 & 1997, Lee Rinker/1997. Kokrak was inducted into the Xavier University Athletic Hall of Fame in December 2015, where he was a two-time Atlantic 10 Conference Golfer of the Year and was a member of three NCAA tournament teams. He is Xavier’s first PGA TOUR member. FedExCup leader and World No. 1 Dustin Johnson posted 71-69 over the weekend, including nine bogeys, to finish T13 and retain his No. 1 position in the FedExCup standings. Johnson was seeking his fourth victory in six starts. 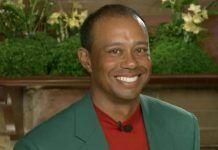 His three wins this season were consecutive–Genesis Open, WGC-Mexico Championship, WGC-Dell Technologies Match Play—and he holds the current-best streak on TOUR for having recorded victories in 10 consecutive seasons. Since 1986, when the Official World Golf Rankings were introduced, there have been 12 players (including Dustin Johnson) who have competed in this event as World No. 1. Prior to Johnson, the last World No. 1 to play at the AT&T Byron Nelson was Tiger Woods (2005/MC). Johnson began the week seeking to become the first World No. 1 player at the AT&T Byron Nelson to win. The best finish by a World No. 1 at the AT&T Byron Nelson belongs to Tiger Woods, who finished solo-third in 2002. Sean O’Hair posted a bogey-free 68 in the final round, one of only eight bogey-free rounds for the week and the only one on Sunday, to move into T5, his best finish at the AT&T Byron Nelson since his runner-up result in his tournament debut in 2005. O’Hair posted four sub-70 rounds this week, a feat he also achieved here in 2005. Byeong Hun (Ben) An finished T5 in his first start at the AT&T Byron Nelson, his fifth career top-10 in 42 starts on TOUR. It marked the first time in his career he recorded back-to-back top-10s in consecutive starts having come into this week off a T8 finish at the Wells Fargo Championship. An earned his 2016-17 PGA TOUR card through the Non-member Money List after carding five top-25 finishes in 14 starts last season. Danny Lee recorded his best result in six appearances at the AT&T Byron Nelson with a T5, marking the first top-10 finish this season for the Korean-born New Zealander. Lee resides in Irving, Texas and is affiliated with the TPC Four Seasons at Las Colinas. With rounds of 70-70-64-68 Lee has now shot 13 consecutive rounds of par or better in this event. Bud Cauley posted his fourth consecutive top-10 finish on TOUR with a T5 (T5/AT&T Byron Nelson, T5/Zurich Classic of New Orleans, T10/Valero Texas Open, T9/RBC Heritage). After missing the cut in 2014 and posting a T4 last year, Cauley, who has yet to win on TOUR, made his third start at the AT&T Byron Nelson. Canada’s Nick Taylor closed with 65 to match his career low round on the PGA TOUR (five times). Before Sunday’s 65, his most recent was at last year’s Wyndham Championship, in the second round. Weekend rounds of 66-65, to finish T9, marked his lowest back-to-back rounds on TOUR since becoming a member in the 2014-15 season. It also marked the first time in his career he posted top-10 results in consecutive starts on TOUR (T8-2017 Wells Fargo Championship). Taylor began the AT&T Byron Nelson at No. 74 on the Presidents Cup International Team points list. 2014 Mackenzie Tour-PGA TOUR Canada Order of Merit winner and Player of the Year Joel Dahmen, who is making his first start at the AT&T Byron Nelson, shot a final-round 67 to finish T9, his best result in nine career starts on the PGA TOUR. His previous-best was T48 at the AT&T Pebble Beach Pro-Am earlier this year. The 29-year-old survived being diagnosed with testicular cancer in 2010 to return to professional golf in 2011. After finishing 25th on the 2016 Web.com Tour money list, Dahmen was awarded the final PGA TOUR card at the conclusion of the Web.com Tour’s Regular season, joining Mackenzie Hughes and JJ Spaun as Order of Merit winners to earn PGA TOUR cards for 2016-17. Defending champion and 2017 Masters winner Sergio Garcia had an up-and-down week with rounds of 73-65-64-74 to finish T20. Garcia’s first start as a professional in the United States came at the 1999 AT&T Byron Nelson (finished T3). Eight past AT&T Byron Nelson winners are in the field this week. Here’s a look at how they finished: Jason Day (2nd), Sergio Garcia (T20), Jason Dufner (T13), Keegan Bradley (T27), Ernie Els (T35), Brendon Todd (T70), Steven Bowditch (MC), Rory Sabbatini (MC). At the suggestion of 2015 AT&T Byron Nelson winner Steven Bowditch, players, officials and caddies wore Rubik’s Cube stickers to show support for fellow PGA TOUR professional John Senden and his family. Last month, Senden announced he was taking indefinite leave from the TOUR after his son Jacob was diagnosed with a malignant brain tumor. The Rubik’s cube is one of his son’s favorite toys. Senden, a Dallas resident, attended the tournament with Jacob on Sunday. The par-4 third hole played the toughest for the week with a 4.337 average. The par-5 7th hole played the easiest at 4.489. Shawn Stefani was disqualified before the final round for signing an incorrect scorecard after round three.